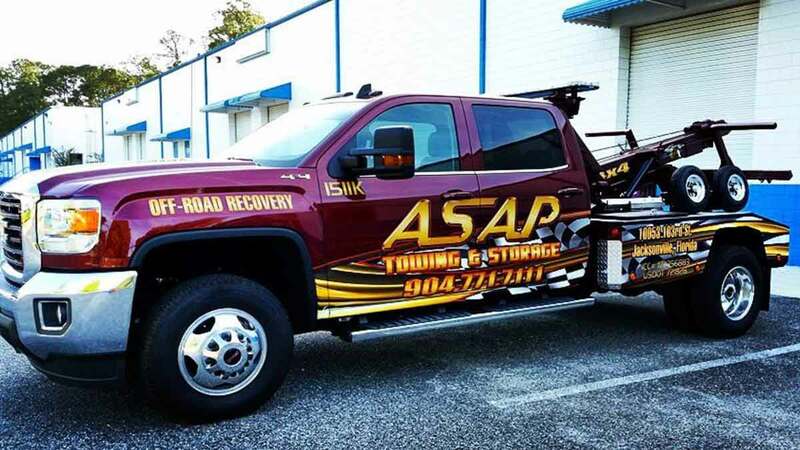 ASAP Towing & Storage provides fast and affordable flat tire changing services on I-10, I-95 and throughout NE Florida. We can remove your flat tire and replace it with your spare tire in minutes. Tire changing is dangerous in high traffic areas like the interstate or along the highway, so let the team at ASAP, a company with experience in providing safe tire changing services, do the risky work for you. We can also locate and tow your vehicle to the nearest repair facility if you do not have a working spare. 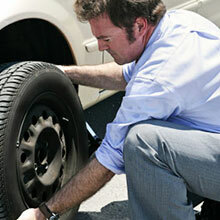 This ensures you get your tire fixed as quickly as possible and get back on the road. Contact our Tire Changing Team now at 904-771-7111. ASAP provides 24hr jump start services in Duval, St. Johns and Clay Counties, and throughout Jacksonville and St. Augustine. Our service truck is equipped with mobile jump start equipment capable of jumping vehicles even in the tightest garages and most remote areas. Did your battery die while you were enjoying the beach? We’ve got you covered. 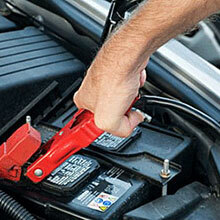 Call our 24hr jump start service team today at 904-771-7111. With quick lockout services throughout Jacksonville, St. Augustine and greater NE Florida, you never need to worry about locking your cars inside your vehicle. 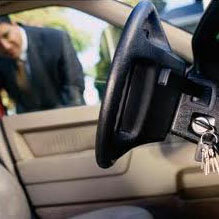 ASAP Towing & Storage provides car door unlocking service for all vehicle makes and models. Whether you locked your keys in your car, truck, or your RV, our trained and experienced team of roadside assistance providers can get your car door unlocked and get you on your way in minutes. Call our 24hr dispatch center now at 904-771-7111 or use the “Send My Location” button to get our roadside team headed your way now. 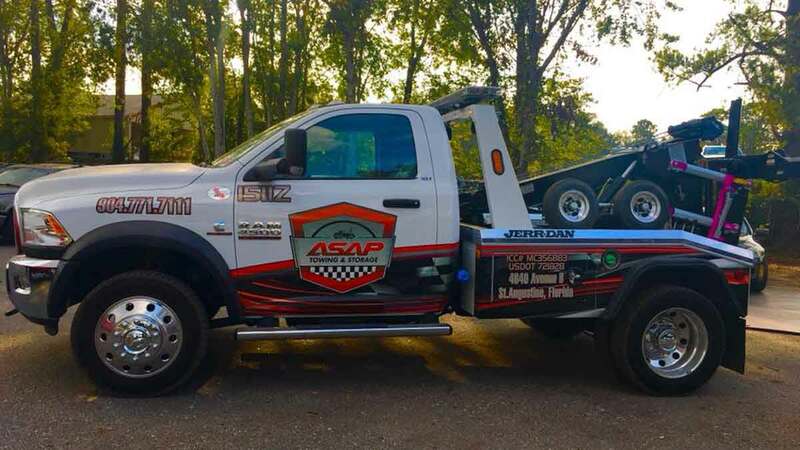 ASAP Towing & Storage provides quick gas delivery services throughout Jacksonville, St. Augustine, Duval County and the surrounding NE Florida area. 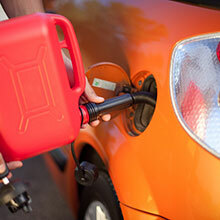 Being stranded without gas doesn’t have to be a stressful interruption to your busy day. ASAP Towing & Storage can arrive at your location with 2 gallons of gas quickly and get you back on the road to complete your journey. Call 904-771-7111 for speedy gas delivery. Not sure where you are? Use the “Send My Location” button to provide a pinpoint location to our dispatcher. Should you find yourself in need of off road recovery services, do not hesitate to contact ASAP Towing & Storage. With 150+ years of training and knowledge, our team is experienced in damage-free off-road auto recovery and will ensure no further damage occurs to your vehicle. For those off-roaders who get stuck in the mud or beach sand, we offer 24-hour winching services to remove any vehicle. We understand the value of your time and are committed to delivering quick-response roadside assistance to get you back on the road as soon as possible. Call our 24hr dispatch center now at 904-771-7111 to get our Roadside Service Vehicle headed your way.